Beso is Spanish for kiss, and this new Castro tapas spot is billed as a romantic bistro. Which could explain the people making out like they were auditioning for The Notebook 2 next to us at 7pm. Unfortunately, we aren’t ready to round the corner to second base with Beso yet. Why? Beso is missing the Feel Good Factor - and we’re bummed about it. Spanish food isn’t the most popular in the city, and we were pumped to try out a new tapas spot. 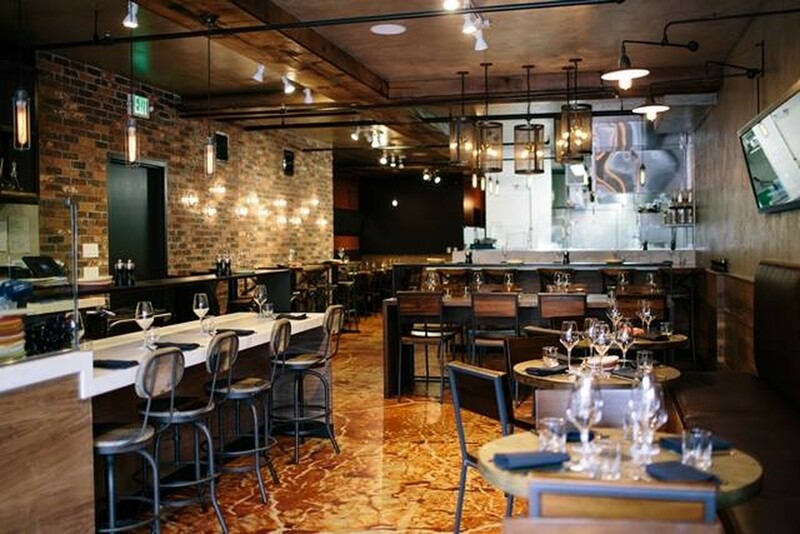 While the kitchen is churning out a few excellent dishes, the vibe is a little Orlando upscale-chain bistro - basic wood and brick, bright lights, and tables just a bit too snug. Beso is the second venture from Bisou's team. We’re hoping they just need to work out a few kinks, adjust the playlist, and dim the lights. Because they have potential. Beso’s tapas are hit or miss. The chef knows how to execute on the basics, yet some of the larger plates fall flat. Several dishes are way over-dressed, with Jackson Pollock sauce explosions everywhere. On the other hand, the paella is A-list and the carrot salad is incredible. The Spanish wine list is a highlight: extensive and very reasonably-priced. The tables are set up for parties of two to four, so it could be a good date spot if they can figure out how to improve the vibe and channel the simplicity of the smaller plates across the menu. For now, Beso needs to up its game before we start pondering a swipe right. But after a glass or two of Albarino, we might give it another shot. Appropriately good. They’re potatoes, what do you expect? Crispy outside and soft inside. They're small but pack a punch - little quail eggs on top of chorizo and toast. Yes. The chicken is fine but unfortunately drowned in oil with over-salted salsa verde. Seared over sunchoke puree. The chorizo is "acorn-fed," so now you know pigs eat acorns. And it makes them taste better. Garden-fresh baby carrots with addictive smoky almonds and a rich yogurt sauce. The fried cilantro on top is surprisingly cool. Get this. Delicious but super rich. It’s served in a plate of salty oil. Keep some bread nearby. This creature was massaged into submission and insanely tender, but the dish was over-trussed with garnishes that didn’t add much. Heavy on the seafood, plus, monkfish is a creative addition. Also, lobster broth. Get involved. An excellent way to trick a five-year-old into eating spinach. Pureed veggies fried into croquetas, drizzled with sauce over crazy good pistachio puree. Short version: fancy tots. A brownie with ice cream. We went with a salted caramel scoop and didn’t regret it. But the brownie was undercooked.